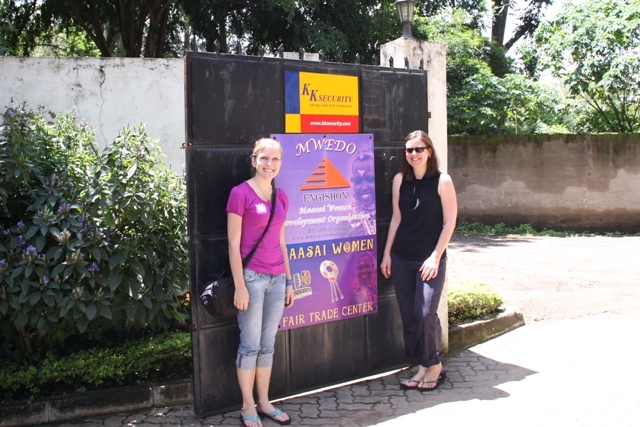 Hadley and Danielle at the Maasai Women's Fair Trade Center in Arusha, Tanzania, April 20. As we sit here in our hotel in Arusha, Tanzania, we are watching the news for updates on the openings of European airports. Yes, we are one of the thousands of people stranded following the eruption of the volcano in Iceland. We were in Arusha last week for the 2010 International Military HIV/AIDS Conference which ran from April 12-15, (See related article: http://www.africom.mil/getArticle.asp?art=4270&lang=0) and expected to return to Stuttgart that week. No such luck. We have been repeatedly struck by how warm, friendly, and sympathetic the Tanzanians are about our situation. We walked into the hotel tired and disappointed by the news that our flight was cancelled, but the hotel staff couldn’t have been any nicer, offering us juice, expressing how sorry they were for our situation, and promising to keep us updated with flight information. Being stranded is never fun, but we decided we should make the most of the situation, and see as much as we could in Arusha and learn about local culture. So today, we set out on a mission to learn more about the Maasai culture and hired a local guide named Hassan to show us around. The Maasai are an indigenous African ethnic group located in Kenya and northern Tanzania. We gave Hassan a general idea of what we were interested in, and he created a full itinerary to introduce us to the local culture. He first took us to the Maasai Women’s Fair Trade Center, which is a development organization that supports Maasai women in the areas of education, health, and economic empowerment. We talked to a Massai woman who was helping to run the center, and she was very helpful in talking about the programs that the center runs, how it benefits the women and their families, and shared with us stories of President Bush’s visit there in 2008. We also had the chance to buy the beautiful handiworks and crafts made by local women and to support the organization. Next stop was a Maasai market we happened to pass along the road. Hassan told us this was a great opportunity to talk with the local people and ask them questions. We found that the market happens only once a week on Tuesdays so we were really lucky to have stumbled across it. Hundreds of people from all over the Arusha area were there, buying and selling fruits, vegetable, clothes, tools, and even shoes made from tires. Both of us were particularly interested in the tire shoes, which we noticed everyone seemed to be wearing. Before we knew it, we were being fitted for our own custom-made pairs. As the shoemaker was carving the rubber and driving in nails into our new shoes, a small crowd gathered to watch and talk with us. Many of them found it amusing that we wanted to wear shoes like theirs. The shoes are literally made from tires with the tread on the bottom, and they are shaped like rectangles. Evidently they can last for years. One of the men we met while we were being fitted for shoes offered to show us around the Maasai cattle market, which was hidden behind the main market. The adjoining market had dozens of cattle that were there for trading between communities and selling to vendors for meat. We learned that the average price of a cow is one million Tanzanian shillings, or 800 U.S. dollars. While we were there, a lot of people stopped to talk to us, especially about our new tire shoes, which we were then wearing and attempting to break in. On the way back to town, Hassan asked us if we would like to try some game meat at a restaurant owned by a friend of his. We weren’t sure what he was referring to but we said we’d give it a try. It turns out this out-of-the-way restaurant is extremely popular with local families especially on the weekends, when many of them spend all day there sitting under the trees, enjoying the peaceful setting. While we waiting for our food to come out, we talked about what we had experienced in the market, and Hassan told us that most people in Arusha are either farmers or cattle herders, and tourism is a significant industry. We told him how we had found Tanzanians to be so friendly and welcoming. He said that he was happy to hear that, as people take pride in their country here and being a good host is very important to them. Well, before we knew it, the waitress brought out a plate of eland, in the antelope family, and a bowl of ugali, a Tanzanian staple food made of corn flower, which is traditionally eaten with your hands. Hassan said that a Tanzanian can’t go more than 2 days without a serving of ugali. It was interesting to try the local food and we found ourselves enjoying it more than we thought we would. After great food and conversation, we made it back to the hotel, a little sunburned but extremely happy. What a great day! 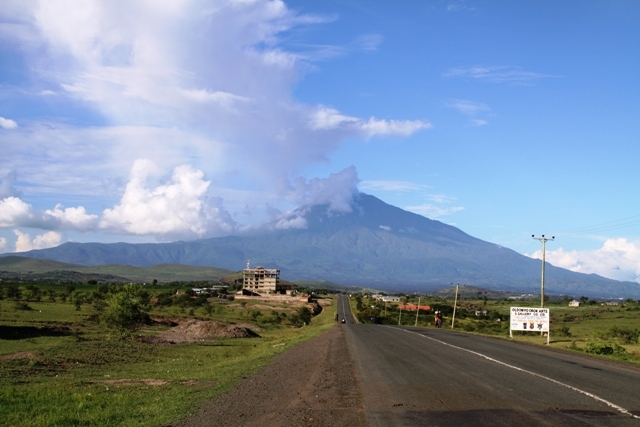 We still don’t know when we are going to leave Tanzania (we’re hoping our Friday flight works out), but are excited to have this opportunity to spend more time here and explore the Arusha area. We look forward to what new adventure tomorrow brings! Danielle Skinner works for U.S. Africa Command Public Affairs, and Hadley White works for U.S. AFRICOM’s Outreach Directorate. 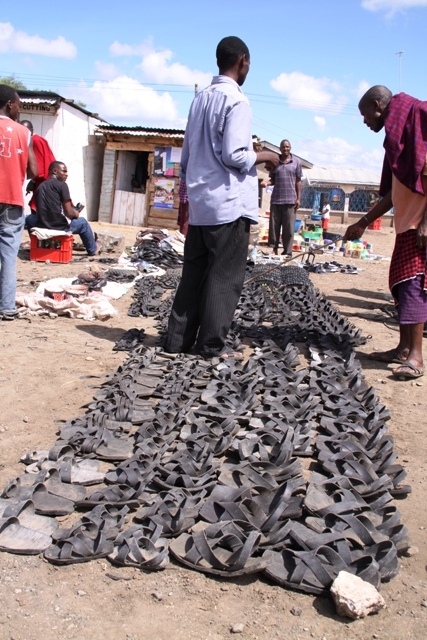 Vendor sells shoes made from tires at a market near Arusha, April 20. 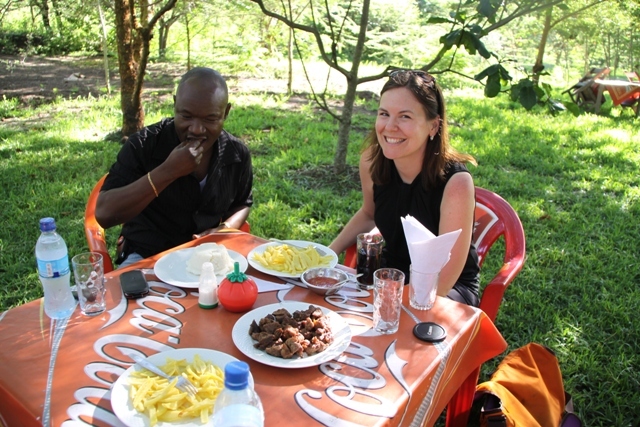 Hassan and Hadley enjoy a traditional Tanzanian meal of eland (type of antelope) and ugali.